We don’t know exactly when the fried-chicken chunks bathed in a sweet, spicy sauce became such a hit, but there is no denying that our people love some General Tso’s chicken, and you'd be hard-pressed not to find it in any black neighborhood from East Coast to West. Sadly, many of us butcher the name (is the t silent?). More sadly, the man who brought this delicacy to the world has died. Chef Peng Chang-kuei (aka Chef C.K. Chang), who created the legendary Chinese dish, died this week from pneumonia, NBC News reports. He was 98. 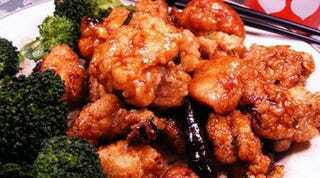 Chef Peng is said to have created General Tso’s chicken in Taiwan during the 1950s. His date with destiny came in 1952 when he was assigned to prepare a meal for a visiting U.S. admiral who had been a guest of Peng's on prior visits. Peng later said that he made a traditional dish sweeter for the American palate and named it “General Tso’s Chicken” in honor of the legendary Qing Dynasty military and political leader Zuo Zongtang, who was from the same Hunan Province as Peng (the chef fled for Taiwan when the communists took over China). Most Chinese in mainland China have never heard of the dish. Peng moved to New York in 1973 and opened his restaurant, Peng Garden, near the United Nations, where dignitaries of all stripes raved about the entree, which comes in many iterations depending on who makes it. Peng moved back to Taiwan in the 1980s, and his funeral will be held this month in Taipei.